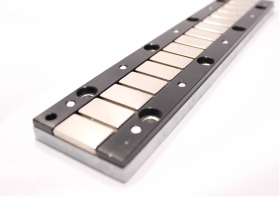 The offer of the magnetic rails presented here is the basis for the construction of highly efficient linear motors. A package of NdFeB magnets is mounted on a soft ice body. The complete component is then used as a stationary stator of a linear motor. The user of these rails has the freedom to choose the rail length and the width of the rails.